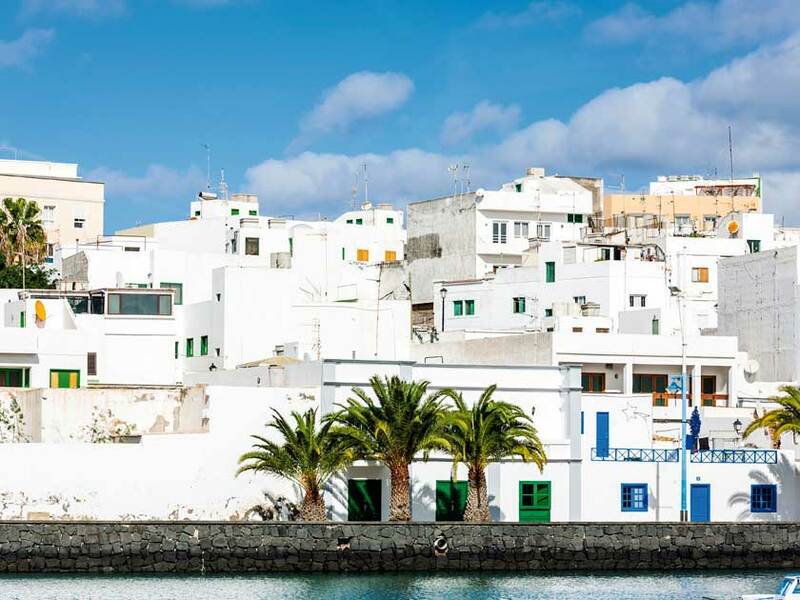 Plan a trip to Lanzarote and not only are you likely to experience a warm welcome – the great weather in Lanzarote means 300 days of sunshine every year – but a wonderful way of life that’s well worth exploring. With light traffic on the roads and well-signed routes, the best way to explore the island is by hire car (try cabreramedina.com). And measuring just 37 miles by 12, you’re never very far from your accommodation. Like the rest of the Canary Islands, Lanzarote’s geology is volcanic, and in order to fully appreciate how this island was born, make sure a trip to Timanfaya National Park is at the top of your itinerary. Take a tour with a guide to experience the true nature of this landscape dubbed the ‘Fire Mountains’ and watch as plumes of steam spurt into the air as water is poured into a deep hole. For, just 30ft below the surface, temperatures can reach a staggering 600ºC. 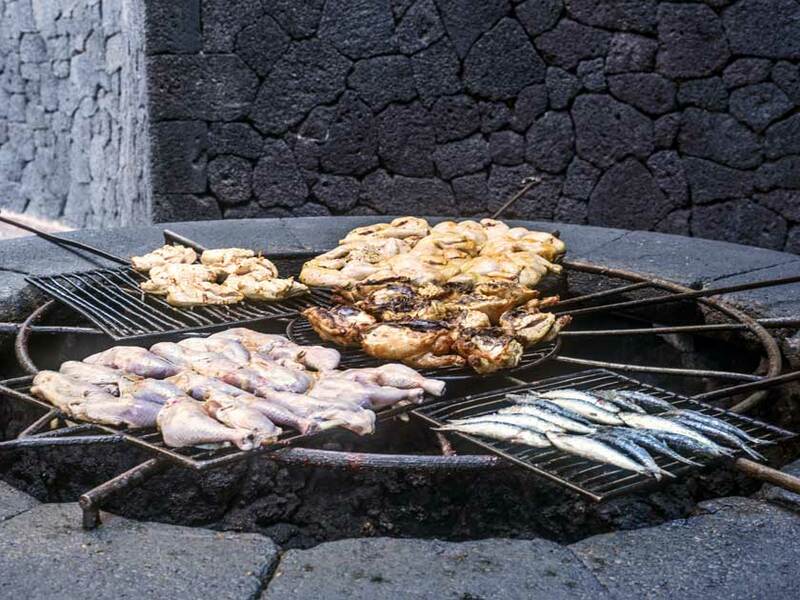 At the El Diablo restaurant inside the park, the chefs have chickens sizzling on spits over another deep hole where the blistering heat wafts up from inside the volcano, acting like an oven. There hasn’t been an eruption since 1824, but although it’s nearly two centuries since the last lava flowed, this shows how it still bubbles beneath the surface of this island. 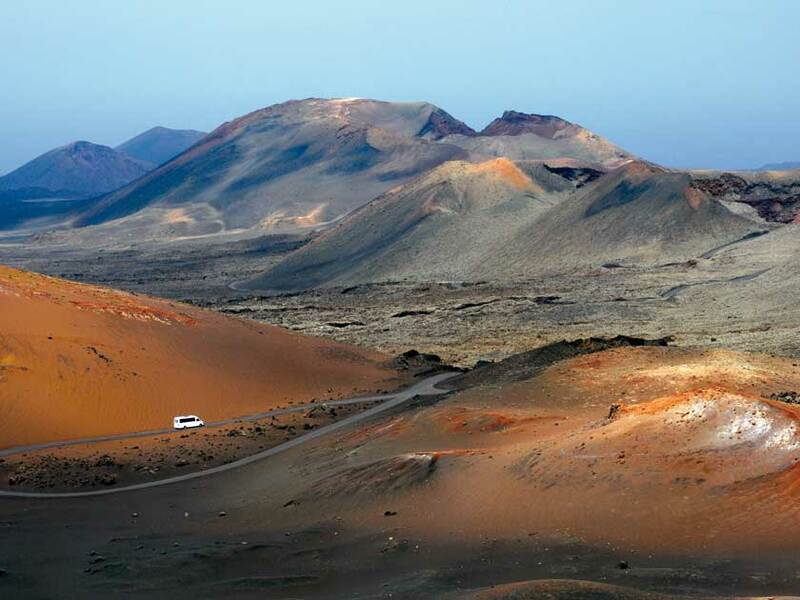 Excursions to Timanfaya are very popular so arrive early, and to learn more about Lanzarote’s volcanoes, don’t miss the nearby visitor centre. Partially sunken into lava fields, it offers fascinating displays, interactive videos and simulated volcanic eruptions, providing a taste of what it must be like standing in the vicinity of a real one. Whether you’re relaxing on a beach or driving around, you’ll soon appreciate that Lanzarote enjoys a relaxed, peaceful, low-key atmosphere. It’s something I noticed while motoring from my base in Puerto Calero, in the south, to the top of the island. Stopping briefly at Yaiza, twice crowned loveliest village in Spain, palm fronds danced in the northerly breeze as I strolled along quiet streets, admiring the sugar cube-shaped houses that are a feature of Lanzarote. 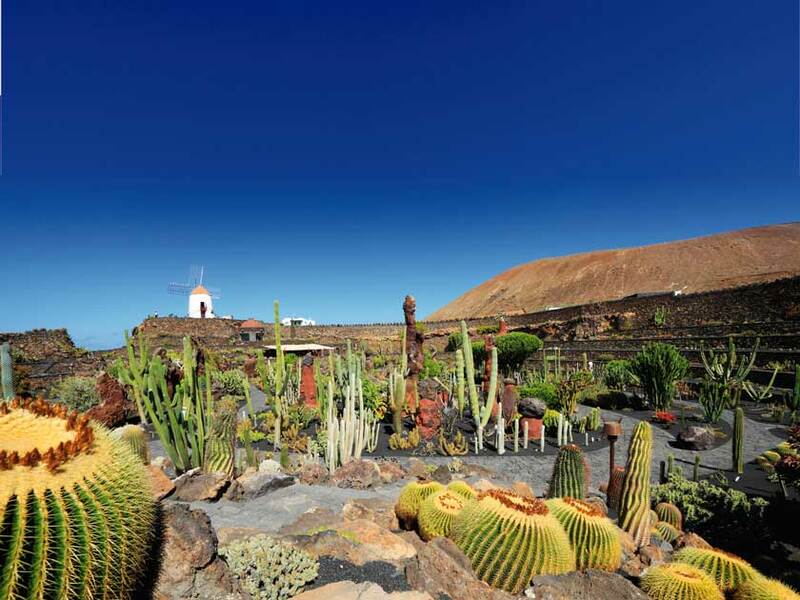 Towards the centre of the island, La Geria is the main wine-growing region. It’s hard to imagine any vegetation thriving in this unforgiving volcanic landscape, but individual vines sheltered by semicircular walls are nurtured by diligent farmers, and their efforts are rewarded with beautiful, crisp wines. The centre of the island is also marked by Monumento Al Campesino and Casa-Museo Del Campesino (Monument and Museum House of the Farmer). This strangely-shaped white public sculpture was erected in the 1960s, designed by the late César Manrique, an internationally-renowned artist and architect who helped shape modern-day Lanzarote. 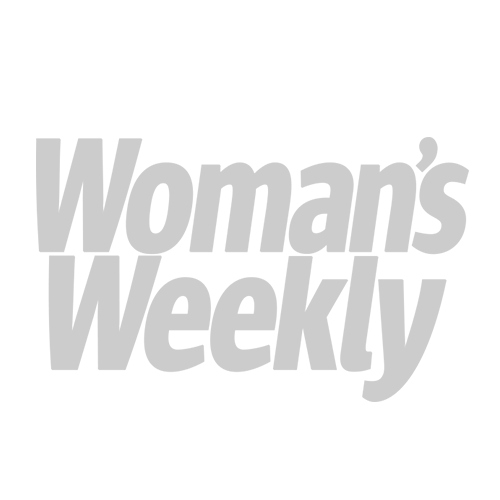 Take a moment to visit the museum, which replicates traditional farm buildings. Manrique’s influences are found all over the island – in particular, his love of wind mobiles is evident from the many displayed at practically every roundabout and junction. His own home, partly submerged in volcanic rock, is a must for your checklist. After admiring examples of his works of art, descend the steps into five volcanic bubbles. Formed during 18th-century eruptions, the artist converted these naturally-formed enclosures into rooms, each possessing its own unique character. A trademark of volcanic islands is black sandy beaches, but Lanzarote has plenty of white sand, too. Most beaches suitable for bathing are found along the south coast – Playa Dorada, in the resort of Playa Blanca, and nearby Papagayo are among many people’s favourites. The latter is one of several secluded coves reached via a dirt track, where the only facility you’ll find is a small open-air snack bar perched above the sweep of pale, powdery sand. Further north, I found my favourite beach: Famara. Set against a backdrop of pinkish 1,500ft cliffs, it’s a magnet for surfers keen to ride the hefty rollers to be found there. Dangerous currents mean that it’s not ideal for swimming but a stroll along its golden sand is a pleasure not to be missed. You can’t travel this far north without visiting Mirador del Rio. This viewpoint close to the island’s northern tip, with its restaurant and fine viewing platform, is the work of the prolific Manrique. 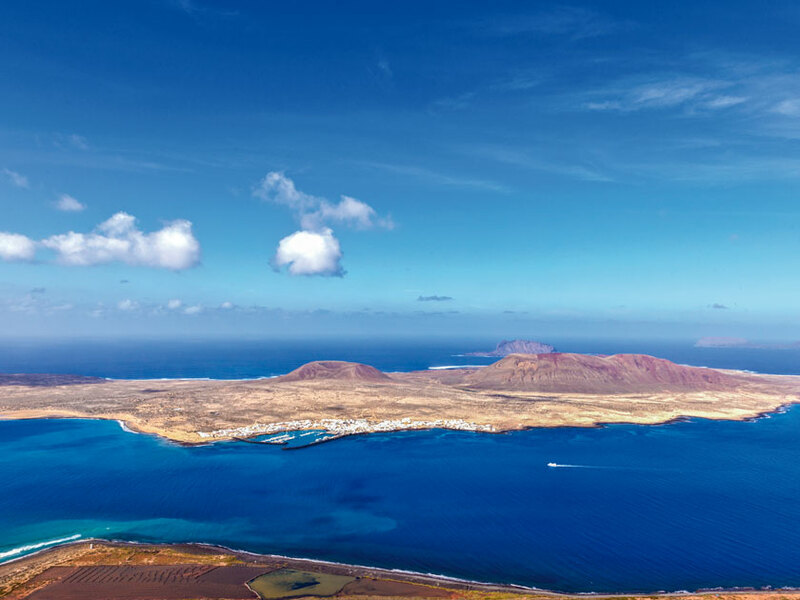 It’s worth paying the entrance fee for the stunning panoramic view of the open ocean and Lanzarote’s sister island, tiny La Graciosa. Catch the ferry (adult return, €20, lineasromero.com) from the northern town of Orzola for the short crossing to this island with no roads, a handful of houses, several sandy beaches and plenty of peace and quiet. Other highlights include a quarry-turned cactus garden with nearly 1,500 varieties, and an exotic underground water garden, also both Manrique masterstrokes. But make time to take a guided walk through a section of the Green Caves, among the world’s longest lava cave system, now a popular attraction. Formed some 3,000 years ago, this magical labyrinth is illuminated by strategically-placed lighting that highlights the impressive rock formations. Fish and meat dominate menus, but everything from English to Chinese cuisine is also offered. There are many restaurants worth trying, including Castillo de San José, built inside an 18th-century castle overlooking Arrecife Harbour, and at Monumento al Campesino, where a monument stands in honour of the island’s farmers. EasyJet Holidays (020 3499 5232; easyjet.com/holidays) offers four nights’ b&b at the five-star Hesperia Lanzrote Island in Playa Blanca from £382pp, based on a 7 July departure from Bristol. For car parking options at Bristol, see bristolairport.co.uk/parking. Transfers can be arranged. Seven nights’ b&b from Gatwick would cost £504pp. Car hire on Lanzarote from Cabrera Medina (cabreramedina.com).